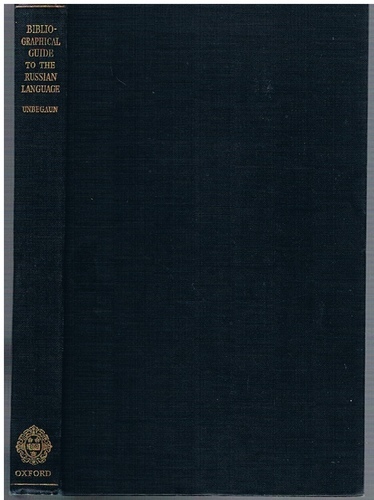 A Bibliographic Guide to the Russian Language. With the collaboration of J.S.G. Simmons. A good, clean, tight copy. Usual blue cloth lettered in gilt. No dust-wrapper. 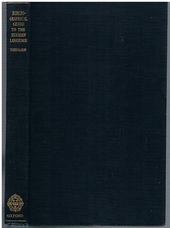 ; Bibliography of books on Russian philology. Still not superseded. Boris Ottokar Unbegaun was a Russian Slavic German. During the Russian Civil War he fought on the side of the Whites. After leaving Russia, Unbegaun settled first in Slovenia and then in Paris. In 1940 he was deported to Buchenwald. After the war he taught at Strasbourg, Oxford (where he had the chair of Comparative Slavonic Philology) and New York. As C. L. Drage said in his obituary (1973) " Boris Unbegaun belonged to a distinguished line of teachers of Russian and Slavonic philology".